That intergovernmental organizations do not operate effectively has long been apparent. Why they fail to do so has puzzled observers, as has the lack of a satisfying explanation of how these institutions actually do work. 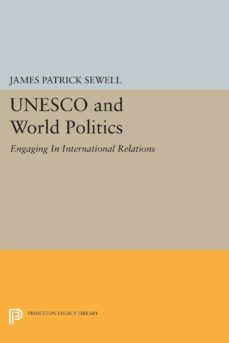 Using the concept of "engaging," James P. Sewell investigates the development of the United Nations Educational, Scientific, and Cultural Organization (UNESCO).The concept of engaging—becoming involved or more involved in a continuing international relationship—permits the author to focus on levels and timing of participation as well as on the participants motives. Drawing on extensive interviews and on published and unpublished material, his study traces UNESCOs formation and evolution from 1941 to 1972. He considers different forms of engagement, conditions of their effectiveness, and the important role played by political leaders. The concept of engaging provides new insight into several significant questions. How and with what domestic consequences do actors respond to the challenges of an international organization? Why and how do executive managers induce closer engagement in their institutions? Professor Sewells innovative approach is applicable to the study of all types of intergovernmental organizations.Originally published in 1975.The Princeton Legacy Library uses the latest print-on-demand technology to again make available previously out-of-print books from the distinguished backlist of Princeton University Press. These paperback editions preserve the original texts of these important books while presenting them in durable paperback editions. The goal of the Princeton Legacy Library is to vastly increase access to the rich scholarly heritage found in the thousands of books published by Princeton University Press since its founding in 1905.